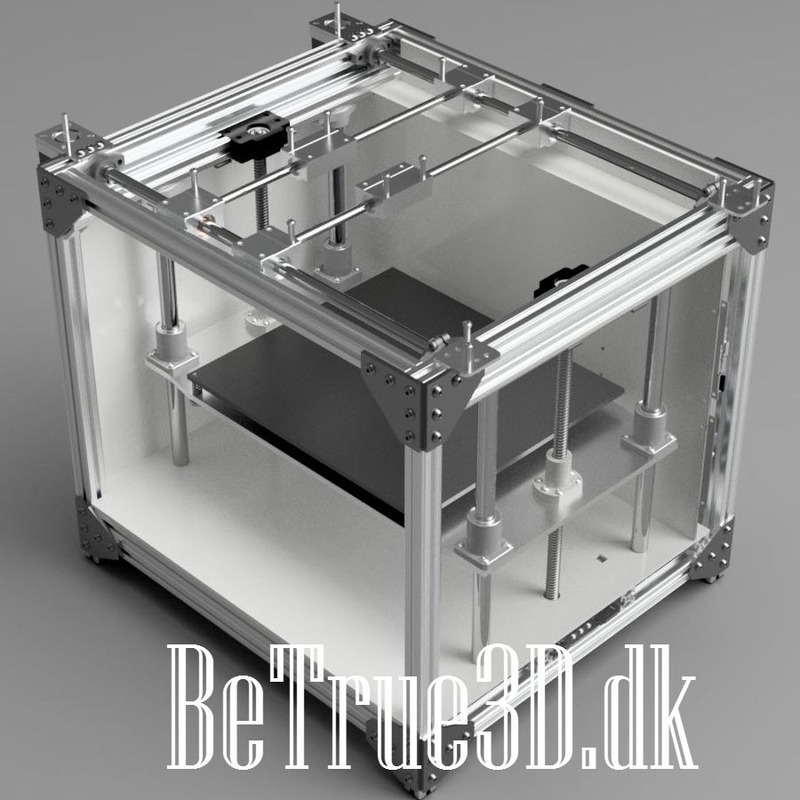 BeTrue3D Printer – The Final design for “production”. Decided to build instead of buying a frame. I had my eyes set on the Folkertech FT-5 case without all the internals, but I opted to design my own case to get it just as I liked – and to achieve a smaller footprint. I’m using Autodesk Fusion 360 which is free as long as you are a private person, or a small startup. The Trial description for the download is rather misleading. Most of the parts I needed was free for download, so it was a lot like playing with Lego.. and yet not at all. It took a lot of trying out, measuring and planning. 4 major iterations later, and I have my finished case designed. Just as Autodesk introduced branches and sandboxing in the workflow… could have used that! I have had quite a few requirments for the build, which has had an impact on the final result. Printarea using the Diamond hotend must be over um2 size (21×22 ish) but well under 30x30cm – I didn’t want a huge printer. I learned the Fokertech FT-5 is in the “huge” category. Internals must be highly optimized, as I do not want a huge printer. Outer dimensions as small as possible. An XY system which optimizes area usage and a system which must be able to provide a sturdy platform for the big Diamond hotend – CoreXY system. No belts or systems running on the outside of the printer – to avoid accidents with small fingers and because of how it looks. No, or very few, custom parts. No printet parts for any load bearing or mechanic solution. Can be used for things like standoffs for electronics, or mount for PSU and such. I wanted to enclose the printer to be able to make heated chamber (passively heated from heatbed). Duet WiFi must be placed in a manner where the (short) WiFi antenna reaches the outside – and to give access to usb and sd on the controller. It resulted in the renderings you can see here. Click for large image – opens new tab/window. First image is without any paneling done, but with the supports intact. You can see the extra crossbeams in the bottom easily, which are purely for the plating. Second image is to show the electronics compartment in the rear. The right-side panel is set to see-through for our use. I’ve made cut-outs for the Duet WiFi board. You might be able to discern the discreet limit-switch I’ve place under the bottom plate, to use for Z-max in Ultimaker 2 style. Matching m3 is made in the Z-gantry plate. I’ll be using 3mm thick white acrylic plates for alle panels. Outer dimensions: Width 46cm (50cm including top mounted motors for XY, which might be moved inside). Projected printarea using Diamond hotend: 24cm x 22cm x 29cm for Z. Add 1-2cm on each axis for normal hotend. The Z-stage is moved up and down using 2x hollow nema 17 motors with 2x bespoke ballscrews, which are inserted through the hollow motors, and attached to the motors using small screws. I’m using a 16mm diameter 325mm long precision steel shaft in each corner of the gantry, for a total of 4 overly thick shafts, which is used to make the z-stage as stable as possible. Hopefully even when using normal flanged bearings, instead of the long variant. I’m not using long variant in order to get maximum out of the Z-axis. The Z-gantry is being milled from a 6mm thick aluminium plate. I’m not making this myself. They can make all kinds of custom sizes and holes for screws as you wish. Note the price is much steeper if you choose a colored model rather than the natural. The XY axes are using standad CoreXY mechanics. It might look like I’m using dual-axes but I’m not. I just opted to use 2 sliders (SCS-12UU) on each 12mm precision shafts for the X axis to give a wider contact area to make it more stable. A couple of 8mm 310mm long precision shafts are spanning over to the other side, making up the Y axis. There is 1 long SCS8LUU slider on each of the 8mm rods where the Diamond hotend is going to be mounted between them. All sliders are using selpgraphite bushings instead of ball bearings for lower noise and less maintenance needed. It does require perfect square of my axes though. I hope I can fit the Diamond 5way Hotend in between the SCS8LUU and only have the nozzle below. Due to the construction of my printer, I might have to lower it a good deal farther, which in turn is going to pull the sliders farther apart (which means less actual print area available) as the Diamond hotend is much wider the farther up we go. I have considered placing the Diamond hotend below and between the sliders, which could be a very good compromise between X, Y and Z spaceusage. I have ordered most parts like motors, brackets etc from RobotDigg while all the 2020 aluminium extrusions (the metal bars I use to build the case) and precision shafts have been ordered from Motedis. I spent around $200 + shipping from Robotdigg and €100 or so from Motedis. As you can see it is a lot of metal! I am going to type in all parts again, so please check back over there. I recently recieved the biggest expansion board for the Duet WiFi -> the Duex5 which is just awesome! It came with the small 100-pin ribbon cable and lots of connectors. It comes fully featured with 5x TMC2660 drivers, output for 5 hotends and much much more. Head over and read all about it. Build in 12v switching when using power other than 12v. Most people are using 24v powersupplies when building new modern printers, but much of our asseccories like LEDs and FANs requires 12v. I’ve previously used either a seperate 12v psu or a DC-DC convert to convert 24 to 12v. But that was not enough, I also had to find a mosfet board to do the actual switching, which makes for a lot of wiring and extra parts.. All this is taken care off in this one brilliant addition! Very nice, and very well thought out! While modelling the case I looked for and found a model of the Duet WiFi on GrabCad. I used his model and created my own 3D version of the Duex5 on GrabCad. All credit goes to the original maker, as I really just moved stuff around. You’ll notice the textures are missing from my model, but there are photos included. While waiting for my parts to arrive and I can start assembling, I am going to work on getting to know the RepRapFirmware on the Duet WiFi controller. So far I have made a blog post about getting started and blog post about updating the firmware. Next couple of posts are going to consist of wiring up the Duet WiFi and configuring the firmware basics. As you might know, there ARE posts relating to these items. A lot of them actually, but I’ll try to keep it way down basic in tune with my previous Instructables for everyone. Untill next time, you might want to look in on my BeTrue3D Facebook page, where I post short updates.